On April 12, U.N. Security Council and the A.U. Peace and Security Council issued statements about the rising conflict between Sudan and South Sudan yesterday, with the U.N. demanding and the A.U. calling on both countries to immediately to deescalate conflict along their ill-defined international border, including the South withdrawing from Heglig and the Sudan Armed Forces, or SAF, ceasing aerial bombardments in South Sudan. The two statements also called for the immediate implementation of prior agreements concerning the border and a return to the AUHIP-facilitated negotiation process. For its part, the A.U. Peace and Security Council Press Statement reiterated the critical message that “there can be no military solution to the conflicts in the Blue Nile and Southern Kordofan states of Sudan,” where South Sudan is suspected of providing support to rebel forces and Sudan has engaged in a policy of ethnic cleansing. It remains to be seen what further actions the bodies will take if the conflict continues to escalate. It appears that the parties are not in contact with each other, therefore the situation requires active third-party intervention to prevent the war from expanding. The two statements come on the heels of the South Sudan’s occupation of Heglig, an area containing oil fields and other infrastructure critical to both countries’ petroleum sectors. While both Khartoum and Juba claim Heglig, yesterday’s statements from both the U.N. and the A.U. presume that the area lies within Sudan. It is difficult to see why both the U.N. and the A.U. presume that Heglig is not disputed territory, akin to other undefined areas along the North-South border. Since the 2009 decision of the Abyei Arbitration Tribunal, Juba has maintained that Heglig was disputed territory subject to settlement by the Technical ad-hoc Border Committee established under the Comprehensive Peace Agreement to “demarcate precisely the 1/1/1956 north-south borderline.” Alternatively, Khartoum has maintained that Heglig lies within Sudan. 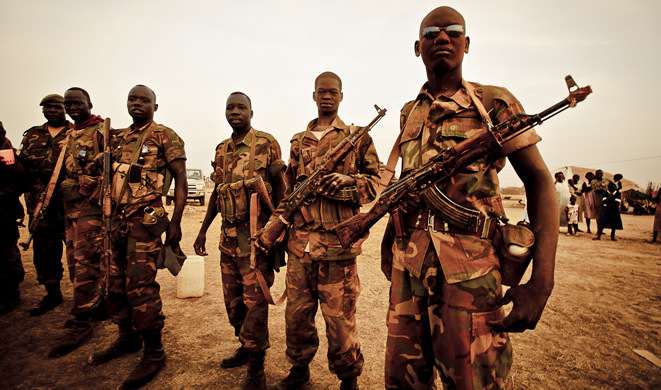 This contradiction in positions seems enough to defined Heglig as “disputed.” The U.N. and the A.U., however, do not appear to see things that way, which may further support the perception within South Sudan that a military solution to the impasse over the border is the only way to ensure its security and territorial integrity. In a statement to parliament yesterday, South Sudan’s President Salva Kiir indicated that the international community has failed in its attempts to ensure Khartoum’s implementation of agreements concluded with Juba, pointing to the continued presence of SAF forces in the dispute Abyei Area, despite a June 2011 agreement between the parties for them to withdrawal. President Kiir further stated that he would not withdraw his forces from Heglig, not because the South is “interested in war,” but, rather, because a continued presence “would resolve this problem once and for all.” Kiir went on to assert that a withdrawal would only occur on the condition that a mechanism would be enforced to ensure South Sudan’s protectionfrom further attacks by Sudan. In a written presidential statement also issued on April 12, Kiir indicated thata U.N. peacekeeping force would be one such appropriate mechanism. President Kiir’s statements appear to indicate that South Sudan may continue to resort to military means in the absence of international intervention designed to ensure implementation of agreements concluded vis-à-vis the border area. The U.N. and A.U. statements were strong in their condemnation of aggression from both sides. However, rhetoric alone will likely not be enough to secure a North-South ceasefire, nor will a resort back to the AUHIP negotiation process without a more concerted diplomatic involvement by critical international players, including China, Ethiopia, and the Sudan Troika consisting of the U.S., Norway and United Kingdom. Sadly, the few agreements that have been concluded under the facilitation of the AUHIP have yet to be fully implemented. This should come as no surprise, given Khartoum’s historic track record of non-implementation of agreements. The international community must heed the lessons of prior failures in Sudan and commit itself to undertaking urgent efforts to deescalate current tensions and ensure full implementation of the June and July 2011 border agreements concluded between Khartoum and Juba.